Palladio's methods were based on rigorous adherence to rules, and were modeled on the precepts of Vitruvius, a Roman architect of the first century BC. Vitruvius wasn't a particularly distinguished architect. He was really more of a military engineer. What made him valuable to history was the accidental fact that his writings survived - the only architectural work from classical antiquity to do so. A lone copy of Vitruvius' text on architecture was found on a shelf at a monastery in Switzerland in 1415. Vitruvius laid down exceedingly specific rules regarding proportions, orders, shapes, materials and anything else that could be quantified. Formulas ruled everything in his world. The amount of spacing between columns in a row, say, could never be left to instinct or feeling, but was dictated by strict formulas designed to confer an automatic and reliable harmony. This could be dizzyingly particular. From At Home by Bill Bryson, page 411 - 412. 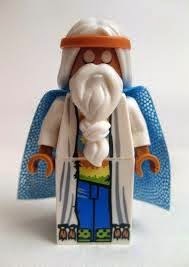 No wonder Vitruvius was the master masterbuilder. Getting in: on a summer update just in time. Twenty one days until the change of season. Had: a lovely summer including two weeks of a house sitting holiday close to the beach. House sitting holidays are the best. Ever thankful to our family members and friends who let us live in their houses at odd times in the year. And while we were at the beach on Australia Day we saw a television team on the shore collecting footage for the evening news so #2 son got himself interviewed and had his five seconds of fame that evening. Saw: several movies during January. Night at the Museum III - very, very good but quite poignant at the end given it was Robin Williams' last film. Madagascar Penguins - crazy stuff. Too much going on for me. Or maybe I was just feeling tired that day. Paper Planes - a great Australian kids' film. Loved it. And the last Hobbit installment - loved it. Better than part two. Some very moving moments between the characters. Great acting. Four films...lots of maltesers. Happy days. Sent: #1 son off to high school after the holidays. He is doing well. It is lovely to see them growing up and thriving and getting all big and independent. Such a gift and a blessing. Thankful: to God for His loving faithfulness. I feel like my prayers have been very small lately (not praying the big prayers at the moment at all) and yet God has answered all of my prayers in all of their smallness in more abundance than I could have ever imagined. More so, He has answered the prayers I haven't prayed as yet but meant to get to at some stage. So encouraged. And ready to pray bigger again. Feeling good: about a less structured year. I have two days that are fairly full and three days that may be filled with relief teaching a bit later on in the year when the teachers are so not freshly out of school holidays. And if not filled by teaching these days will be filled well and appropriately depending on what's on the TO DO list or whether I need to have a quiet one. Even now I still find myself easily wearied. Not quite recovered from last year as yet. God in His kindness has given me some space to rest and also the space to live and respond a little more spontaneously this year. Loving: the old Bible reading plan. Behind already. (Could I have been distracted while on holidays just a tiny bit???) But will catch up again. Looking forward: to my Bible study/reading groups starting up again this coming week. One group will be studying John. Another is reading through the minor prophets in one-to-one Bible reading style. And the group with lots of kids, distracted mothers and one or two enquiring about the Christian faith is going to have a go at a terrific new Matthias Media study called You, Me and the Bible which looks like one-to-one Bible reading meets Two Ways to Live. Reading: At Home by Bill Bryson still. I was trying to think of a word that sums up his writing style and finally it came to me. Endearing. That was two pages before I hit the chapter about rats in homes. Now I am even more certifyably, scream-like-a-girl scared of them! Rats aside, a brilliant brilliant book. Reserved: One Day by David Nicholls at the library. The summer reading continues it seems. Apologising: to landfill. The great two house clear out of 2014 has seen me launch a pitiful assault on landfill. More and more I am committed to the decluttering movement - have only what you need and what is beautiful. Get rid of the extra. And then don't replace it. Fortunately I am not much of a shopper and while we are dealing with the volumes of stuff, we are paring down our own possessions as well. Op shops have done well too but there has been so much that just had to be junked. Becoming addicted: to Gumtree and another online buying and selling site. Not that I am buying anything. Just selling. And it is going well. Although I do have table that no-one seems interested in. No: progress on the Philippians project or the crocheting project. Did write some short letters to send with our Christmas letter - the ones that finally went out by snail mail. I well and truly crossed over to the darkest part of the dark side at the end of last year. No Christmas cards in the post. Christmas letter written and EMAILED out on New Year's Eve. Those that needed to be sent out via snail mail posted, I think, on 28th January. And yet, despite all these things, the earth still seems to be turning. Off: to watch the end of The Hundred Foot Journey newly out on DVD. A beautifully filmed, intelligent, feel good movie. It's gorgeous. 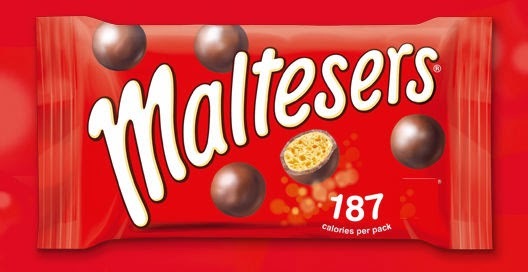 No maltesers. Ah well. I got myself reading glasses two or three years ago and there has not been a day when I haven't been thankful for them. It is truly miraculous to be able to read print so easily. But clearly in the time I've had them I haven't read lots and lots. How do I know? Because this holidays I read a vast amount and the bridge of my nose where my glasses sit is slightly tender. But so worth it. It has been a joyous time with so many good books. 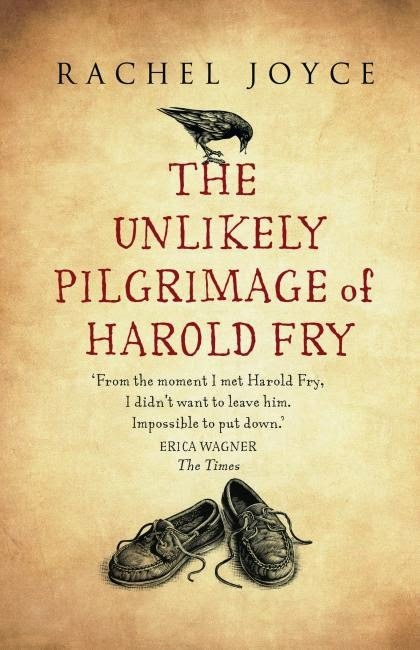 This summer's reading commenced with The Unlikely Pilgrimage of Harold Fry by Rachel Joyce. I have declared this to be the best novel of 2015, which is a big call so early into the year. Harold receives a letter from Queenie, a friend and work colleague from many years previous, letting him know she is dying and is thankful for his many kindnesses shown to her all those years ago. In shock, he pens a quick letter back and sets off to post it. When he reaches the mail box, deep in thought and memory, he isn't quite ready to let his letter go and head home so he decides to walk to the next letter box, and then the next and then the next...and ultimately he walks the entire length of England from south to north, to deliver the letter in person. But does he make it in time? This is a tale about a journey, reflection, atonement, transitions, moving on. I read The Love Song of Miss Queenie Hennessy, the companion volume to Harold's story, straight after. This is Queenie's story, told while Harold is making his pilgrimage. The benefit of reading them back to back is to see the extremely cleverly crafted parallel journey they take. The downside is that this story is grittier and it takes away some of the innocence of its companion volume...although the truly innocent characters remain innocent in both. I am a sucker for books that tell the same story from different points of view but given my time again I would probably give myself six months gap between volumes. 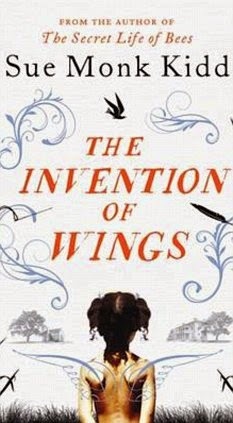 Speaking of telling the same story from different points of view, The Invention of Wings by Sue Monk Kidd is the story of Sarah, a white American, and Handful, her black African slave given to Sarah on her 11th birthday. Both are of similar age. The story commences in the early 1800s - a time when intelligence in women and racial differences were not honoured. (That is putting it positively...) The story spans their lives, told in the first person alternating chapter by chapter between Sarah and Handful, with some delightful twists and surprises for the reader especially towards the end. It doesn't make for easy reading at times - it is difficult subject matter - but Sue Monk Kidd has an astonishingly large and elegant vocabulary and her turn of phrase time and again was breathtaking - and it was her beautiful command of the English language that kept me turning the pages especially in the more torrid sections. Very worthwhile reading. And then Lila. 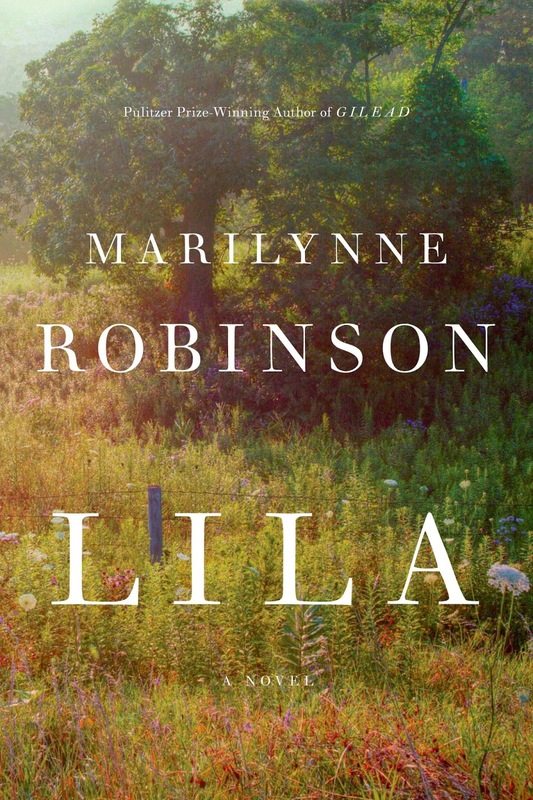 For anyone else who loves reading the same story from a different point of view and loves a novel by Marilynne Robinson, this one ticks all the boxes and more. Companion volume to Gilead and Home, it felt like a sad book at times but at the same time full of hope, light and blessing too. A tale of transitions from harsh life to gentle life. Us reads like a cheery, chatty blog with short, cheery chapters. Douglas (54) is married to Connie and they have one son named Albie (18). Douglas and Connie plan to take Albie on a Grand Tour of Europe to see all the great works of art before he heads off to university. It ends up being a grand tour in which Douglas seeks to save his marriage and reconnect with his increasingly distant son. If you love art and Europe this is a fun read. 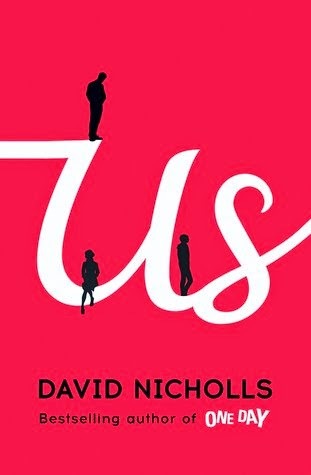 I admit that it was losing me at Amsterdam - which is the cleverness of the writing because Nicholls captures the hallmark elements of each location with each change of scenery - and I only held on because Italy (ah, bell'Italia) was approaching. But I found my happy place in Italy and the novel finished well. It was fun. I would like to get One Day from the library and have a read some time soon. Speaking of wanting to read more of a particular author, I haven't read any Bill Bryson before but it won't be too long before I put his book Down Under (and maybe even some others by him) on reserve at the library. At Home. This is not a novel. It's a history book. And it's fantastic. I haven't finished it yet. 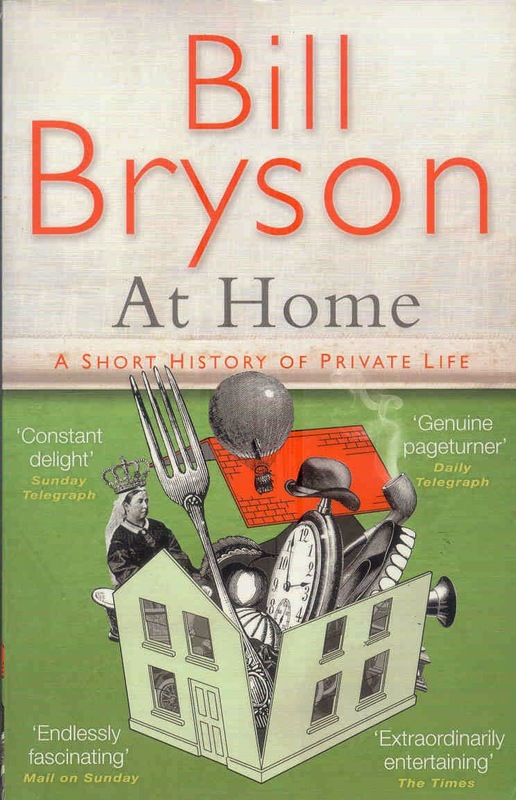 Bryson takes the reader on a tour of his home - a rectory in Engand - room by room, recounting the history of domestic life. Things like why we even have rooms - a relatively recent thing historically speaking - for starters. Things like why we have salt and pepper on our tables and not some other spice, why forks have four tines, a history of lighting and electricity in houses. Windows. How did houses come to have windows? Sounds a bit dry? I do it no justice. This books is a laugh out loud (and I generally laugh on the inside when I am reading but not with this one) and fascinating page turner. The best I can say is that of the eight books I read this summer, this is one of three that I own - not reading this from the library - and it is one I am very pleased to be able to keep on my shelf and share with my friends. 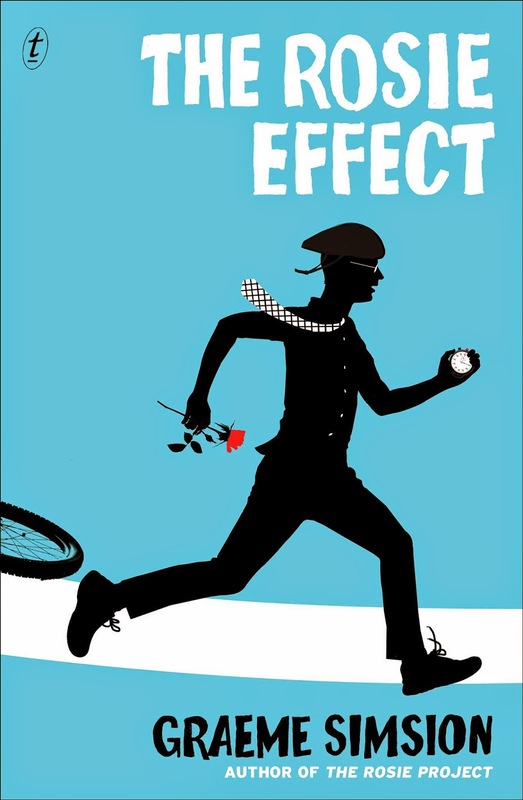 I stopped At Home for a few days because my request at the library for The Rosie Effect, the sequel to The Rosie Project, came up. (And At Home is a book you can comfortably pick up and put down without losing the momentum.) The Rosie Project is a fun read and so is this - good for holidays although you know how sequels are often never quite as good... Compared with The Rosie Project the plot in this one is busy, which is structurally right given the move from single man living and working in Australia to married man living and working in New York. Mix Apserger Syndrome (fairly high end) into the equation and you get the idea. The book captures the changes perfectly. Chaotic at times but it all came together in a very satisfying way in the end. At one stage I was in between books, waiting for The Rosie Effect to come up on reserve at the library and for At Home to arrive in the mail, so I pulled The Happiest Refugee off the shelf where we were staying. 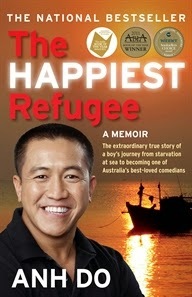 Ahn Do is a Vietnamese refugee, family man and actor/comedian/author. The Happiest Refugee shows life as a refugee (what life was like before escaping, the horrible, horrible escape and what life is like in a new country with few rights and no resources) in a light way. Enough to get a very clear sense of what it is like to be a refugee without leaving the reader having nightmares - enough to engender empathy and response without being paralysed by the horror and with plenty to entertain along the way. And Ahn Do shows gratitude in action. Good work Ahn Do. He also has a series of kids books - the Weir Do series - that does the same thing for children and our boys loved them. But for now, it's back to At Home for me.